Sigma Beauty Affiliate Program: The Sigma Beauty Extravaganza Complete Kit! 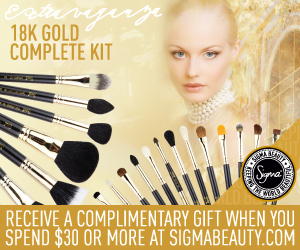 The most luxurious and lavish brush kit is now available from Sigma Beauty! The Extravaganza Complete kit contains twenty-nine of our best-selling brushes, all hand crafted with 18K gold plated ferrules! The stunning kit comes in a deluxe carrying case, perfect for traveling and storage. We have created new affiliate banners for this exciting product launch! To update your blog with one of these banners, simply save the image to your computer, upload the banner to your blog as a picture, and insert your affiliate link as the URL! This is the perfect kit to spoil yourself or a loved one. It is everything you need and more! 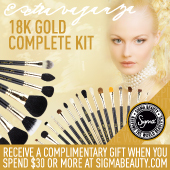 This gorgeous kit is one of a kind and available exclusively at Sigma Beauty! For more information about the Extravaganza Complete Kit, click here! Omg, sooo gorgeous! love it!!! Beautiful! Definitely going on my webby! Lovely!! adding it to my blog! loveeeeeed it! Love these brushes... so pretty I wish I could buy them . @Luciana Please contact affiliate@sigmabeauty with your specific question. Thank you! Thank you for your interest! Please contact annie@sigmabeauty.com with your question!